We’re coming down to it…the term’s end, and summer’s beginning. But a few hurdles lie ahead, though large ones. I’ve finally been free enough to work some, and probably should be working tonight, as late as I’m up. But I’m not. In fact, I know it will, because through the window I can hear the marching synchrony of raindrops on the streets outside. It’s knocked off a bit of the restless wandering urge, this rain, but only a little. It was a cold and steady arm around my shoulder as I walked in it tonight, getting soaked and trying to find the words to compose a prayer. I didn’t have much to say, but couldn’t hear much in return either. It’d be easier if all we had to do is listen, wouldn’t it? I can hear a distant siren crying out as I pick my way down the sidewalk. The dripping trees offer little shelter as I pass under them, but I didn’t come out here for shelter. 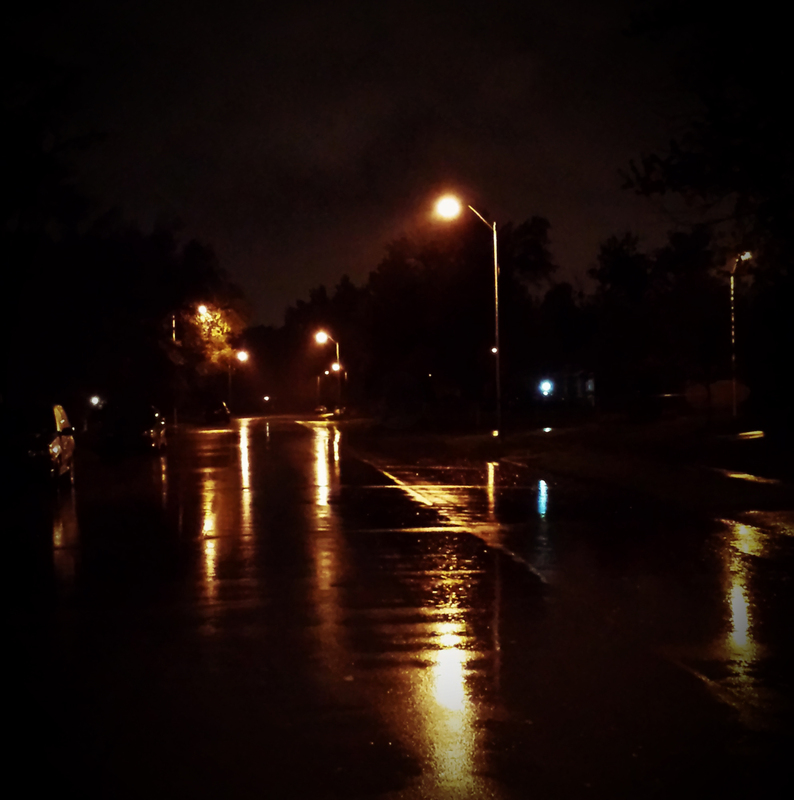 The street lights offer their own interpretation of the rain and bounce their light off the glistening pavement. The stone statue of a dog arrests my attention for a half-second before I see it’s only a statue. By the time I’ve returned, a half-hour has passed, and it seems very little has transpired between my Maker and I. Of all the important things I should want or pray for, of all the sins I should confess or blessings I should count, all the petitions and praises I should offer, it’s only for you that I ask. To find you, and that until then you may find blessing. It’s the only thing I can give you. And for some strange reason, the thought crosses my mind that maybe you’re finding your blessing in the arms of another man tonight. I can only sigh and ask the Lord to let me find someone no less or more flawed than me. I’m sure that will be a low standard with which to measure. There aren’t many people left to talk to these days. There were souls I once knew who could listen and talk, especially late at night, but I’m losing them one by one. And that’s just as well. I’m sure they don’t need a friend to haunt them at night with his meandering thoughts or wandering questions. And I should learn better how to get by without leaning so much on others. Last summer was probably my favorite time of my life so far, so I’ve hopes that this summer will unfold at least as much promise, for travel and new experience. No burgeoning revelations tonight, my dear. No profound thoughts leaking from a wayfaring heart. Just the quiet and simple thoughts of a loveless groom still waiting on his bride.